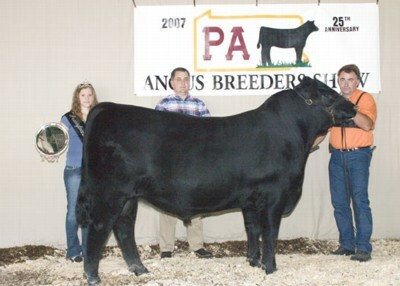 Rains Grid Dream GTNI722 won grand champion bull at the 2007 Pennsylvania Angus Breeders Show, July 14 in Huntingdon, Pa. Dale Rains, Mercer, Pa., owns the March 2006 son of TC Grid Topper 355. Mark Duffell, Aldie, Va., evaluated the 121 entries. Photo by American Angus Association. 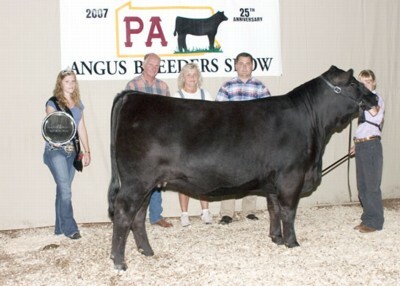 H J M Real Time won reserve grand champion bull at the 2007 Pennsylvania Angus Breeders Show, July 14 in Huntingdon, Pa. Jared Fessler, Robesonia, Pa., owns the April 2006 son of Leachman Right Time. Mark Duffell, Aldie, Va., evaluated the 121 entries. Photo by American Angus Association. 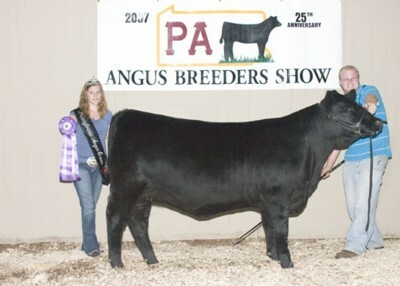 J D H WD VRD Sandy 0776 won grand champion female at the 2007 Pennsylvania Angus Breeders Show, July 14 in Huntingdon, Pa. Alana Eisenhour, Wellsville, Pa., owns the February 2006 daughter of Vermilion Dateline 7078. She first won junior champion. Mark Duffell, Aldie, Va., evaluated the 121 entries. 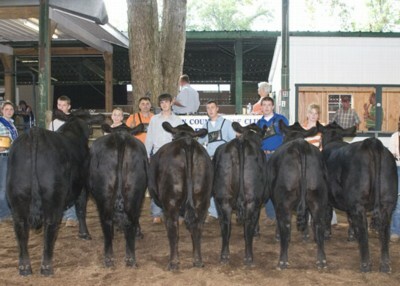 Photo by American Angus Association. 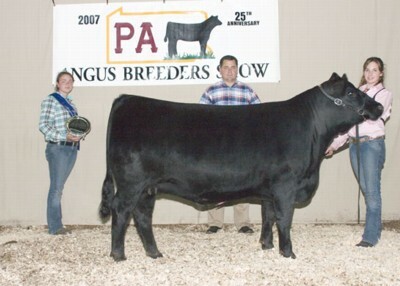 Freys KJF Ark Pride K32-R36 won reserve grand champion female at the 2007 Pennsylvania Angus Breeders Show, July 14 in Huntingdon, Pa. Katrina Frey, Quarryville, Pa., owns the February 2006 daughter of W C C Special Design L309. She first won reserve junior champion. Mark Duffell, Aldie, Va., evaluated the 121 entries. Photo by American Angus Association. 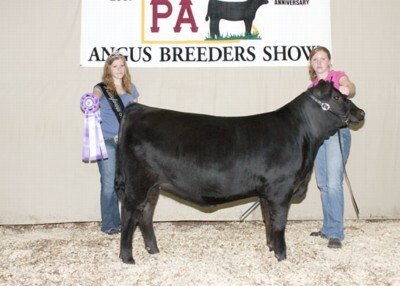 Triple N Cheyenne won senior champion female at the 2007 Pennsylvania Angus Breeders Show, July 14 in Huntingdon, Pa. Katie Nolt, New Holland, Pa., and Jennifer Hower, Bethlehem, Pa., own the winning female. Photo by American Angus Association. 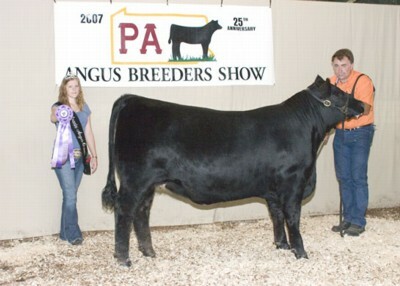 Freys KJF Delia M90-R04 won reserve senior champion female at the 2007 Pennsylvania Angus Breeders Show, July 14 in Huntingdon, Pa. Katrina Frey, Quarryville, Pa., owns the winning female. Photo by American Angus Association. 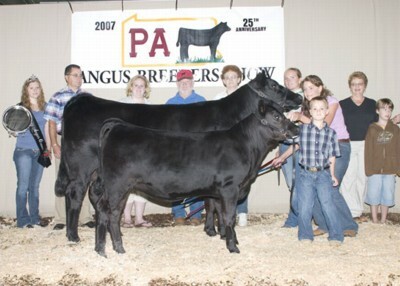 LVA GRF Ginger 605 won intermediate champion heifer at the 2007 Pennsylvania Angus Breeders Show, July 14 in Huntingdon, Pa. Kurt Long, Airville, Pa., owns the winning heifer. Photo by American Angus Association. Rains Free Dreamer Girl FrRD won reserve intermediate champion heifer at the 2007 Pennsylvania Angus Breeders Show, July 14 in Huntingdon, Pa. Dale Rains, Mercer, Pa., owns the winning heifer. Photo by American Angus Association. 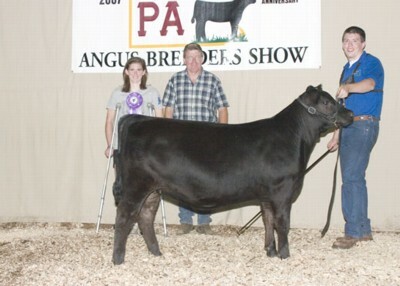 Gambles Elba 9176 won senior heifer calf champion at the 2007 Pennsylvania Angus Breeders Show, July 14 in Huntingdon, Pa. Ryan Fairbairn, Coatesville, Pa., owns the winning heifer. Photo by American Angus Association. Just Enuff Widespread Fiona won reserve senior heifer calf champion at the 2007 Pennsylvania Angus Breeders Show, July 14 in Huntingdon, Pa. Amanda Fehnel, Easton, Pa., owns the winning heifer. Photo by American Angus Association. 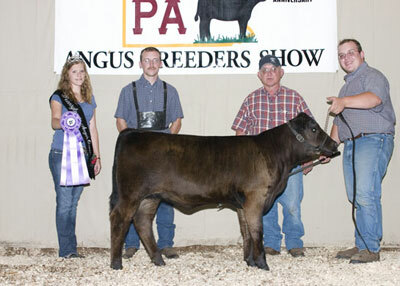 WVF BKE WA Blkcp Tajenae704 won junior heifer calf champion at the 2007 Pennsylvania Angus Breeders Show, July 14 in Huntingdon, Pa. Weaverland Valley Farms, New Holland, Pa., owns the winning heifer. Photo by American Angus Association. 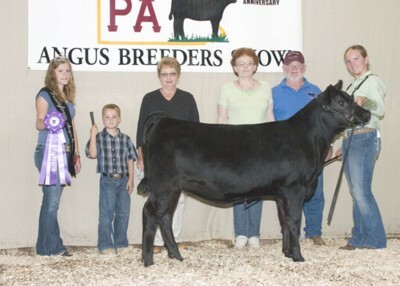 WRN Present 101 710 won reserve junior heifer calf champion at the 2007 Pennsylvania Angus Breeders Show, July 14 in Huntingdon, Pa. William Nichols, Tyrone, Pa., owns the winning heifer. Photo by American Angus Association. 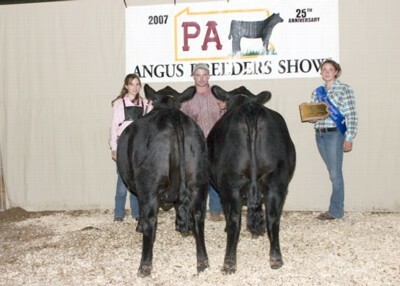 Weaverland Blkcp Britany 506 won grand champion cow-calf pair at the 2007 Pennsylvania Angus Breeders Show, July 14 in Huntingdon, Pa. Brady Ebersole, Harrisburg, Pa.; Roberta & Joseph McMullen, Quarryville, Pa.; and Weaverland Valley Farms, New Holland, Pa., own the January 2005 daughter of Northern Improvement 4480 GF. Her calf is a January 2007 heifer sired by BR Midland. Mark Duffell, Aldie, Va., evaluated the 121 entries. Photo by American Angus Association. 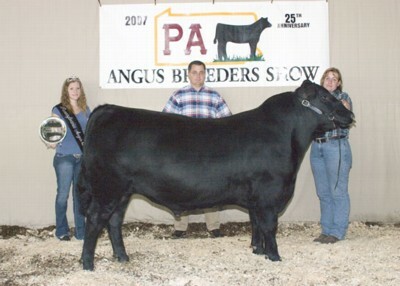 D A Lady Lucy 410 won reserve grand champion cow-calf pair at the 2007 Pennsylvania Angus Breeders Show, July 14 in Huntingdon, Pa. Caleb Schmuck, Rockwood, Pa., owns the March 2004 daughter of Whitestone Battalion L136. Her calf is a May 2007 bull sired by BT Equator 395M. Mark Duffell, Aldie, Va., evaluated the 121 entries. Photo by American Angus Association. 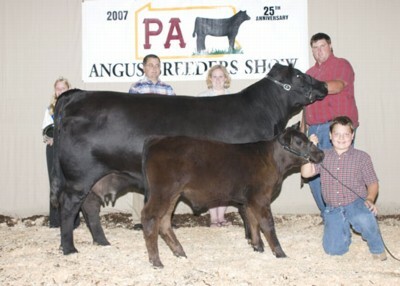 Rains Angus, Mercer, Pa., won breeders' best six head at the 2007 Pennsylvania Angus Breeders Show, July 14 in Huntingdon, Pa. Photo by American Angus Association. 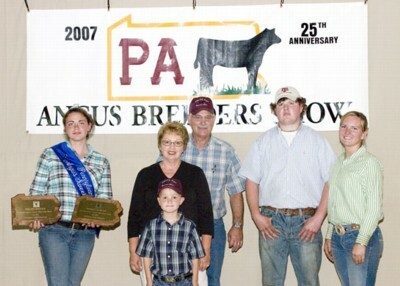 Weaverland Valley Farms, New Holland, Pa., won premier breeder and premier exhibitor at the 2007 Pennsylvania Angus Breeders Show, July 14 in Huntingdon, Pa. Pictured from left includes Jaymi McMichael, queen, Barbara Weaver, Brady Ebersole, Larry Weaver, Darin Wiley and Gwen Powers. Photo by American Angus Association. 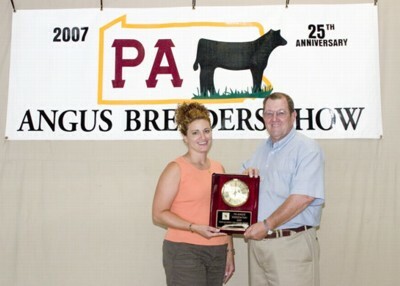 Tammy Weaver, Ephrata, Pa., left, won the Conrad Grove Memorial Award for her dedication and hard work at the 2007 Pennsylvania Angus Breeders Show, July 14 in Huntingdon, Pa. Presenting the award is Harry Bachman, right. Photo by American Angus Association. 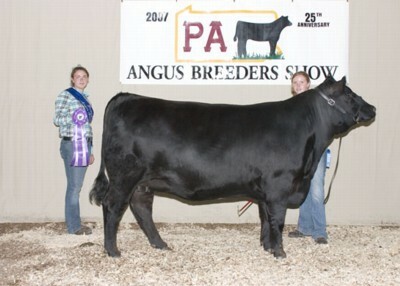 Katrina Frey, Quarryville, Pa., was awarded the Pennsylvania Special at the 2007 Pennsylvania Angus Breeders Show, July 14 in Huntingdon, Pa. Photo by American Angus Association. 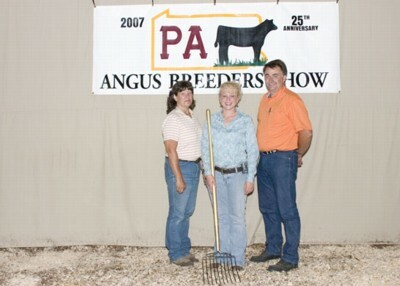 Jaclyn Upperman, Chambersburg, Pa., center, won the Golden Pitchfork Award at the 2007 Pennsylvania Angus Breeders Show, July 14 in Huntingdon, Pa. Presenting the award are Brenda Rains, left, and Dale Rains, right. Photo by American Angus Association.